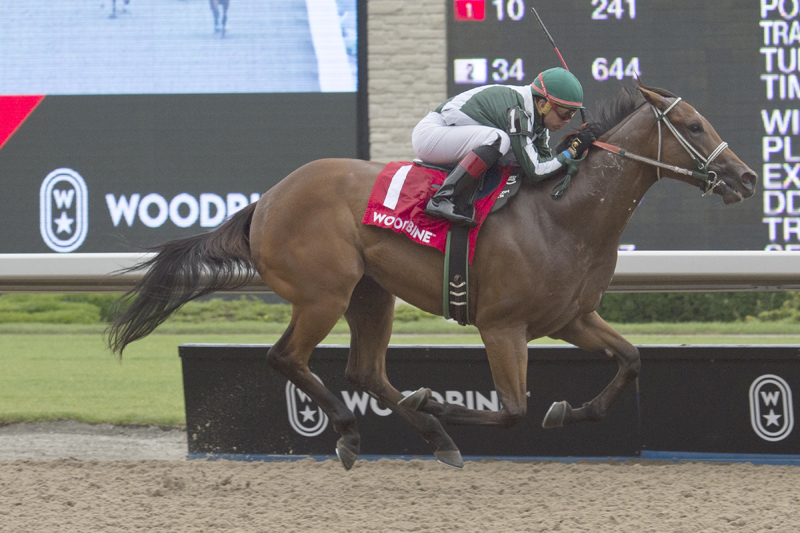 Endeavor Bloodstock’s two-year-old gelding Big Drink of Water floated to his first stakes victory in the $100,000 Victoria Stakes featured Saturday afternoon at Woodbine Racetrack. Leaving inside of four rivals in his Canadian stakes debut, the Teresa Connelly-trained Big Drink of Water set fractions of :22.51 and :45.66 en route to a 2-3/4 length victory in 1:03.74 for 5-1/2 furlongs. Armistice Day, the heavy 2-5 favourite, came on between horses from the back of the pack to finish second ahead of first-time starter Crawl From the Bar. Jockey Pablo Morales was along for the ride, picking up a Woodbine stakes victory for the second consecutive Saturday. He also won the My Dear Stakes one week ago with the John Bourke-trained two-year-old filly Stifling. “He’s just a super talented horse. Every time I’ve been on him, I’m surprised how easily he does things and how comfortable he is. He’s like an old horse,” said Morales after the Victoria victory. “I had an idea before we got in the gate that I was going to find myself on the lead; he was just really ready, really sharp. We’ve been racing him and I know he’s super fit, I was not going to take the race away from him the way he broke. The fractions showed like he was going a little fast, but I swear it felt like I was floating. The Soldat-Vindi Princess gelding now boasts two consecutive wins and one second-place finish over three different racetracks. He was a runner-up in his May 4 career debut at Gulfstream Park and entered the Victoria off a maiden-breaking victory on May 23 at Presque Isle Downs – both 4-1/2 furlong sprints. Sent postward at odds of 10-1, Big Drink of Water returned $22.60 to win and $4.40 to place. There was no show wagering. He combined with Armistice Day ($2.10) for a 1-5 exacta worth $49.90. A $1 trifecta of 1-5-3 (Crawl From the Bar) paid $38 and a $1 superfecta of 1-5-3-4 (supplemental entry Wallace) returned $86.55. The Newfie Express completed the order of finish. Live Thoroughbred racing continues on Sunday afternoon at 1 p.m., featuring the $125,000 Ontario Matron Stakes (Grade 3) as race eight.